Hello, Friday! 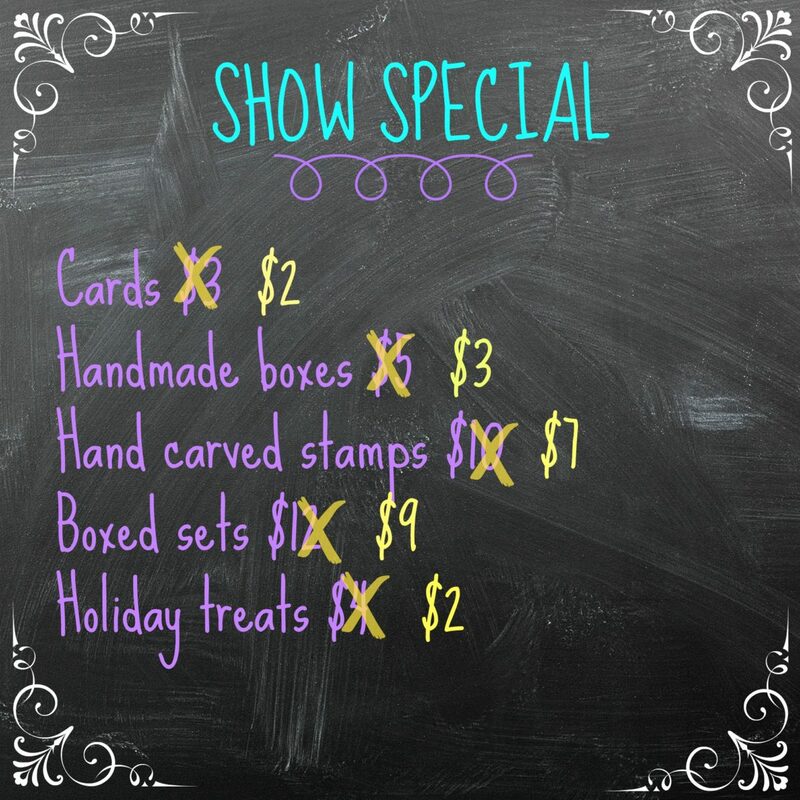 It’s Craft Fair Friday here at Stampin’ Fool and I am going to unload some invaluable information for you crafters. This will hopefully provide you with the confidence you need to start vending, give you tips to increase your sales, or ease your mind about the craft fair experience. If you don’t participate in craft fair, that’s okay, sit back and enjoy the pictures or be inspired to make some items for personal use or gifting. Staging your booth is so very important- not only for increasing your sales, but in creating a brand and helping patrons to remember your store when they have a specific need that you can fill. In order to create a pleasant shopping experience, you will want to take measures to achieve your brand, theme, and presence. I have compiled a list of ten things that are important for crafters to take into account to have a successful fair experience and to provide an inviting booth for the customer to enter and interact with. It can be overwhelming to change everything you have ever known about craft fairs all at once, so start slow if you need to and change a few things at a time until you feel comfortable with your setup. If you implement these tips, you will have better results at your next show! Now that you know what the top tips are for setting the stage of your craft fair booth, I will talk a little bit more in detail about each one. TIP 1. COLOR – Let’s face it, appearance is everything for your table setup. Your buyer is going to be lured in by the appearance of your booth or turned away by the rainbow that vomited all over your tables. Use that to your advantage by choosing a color scheme for the table decor and product set up (White, black & white, black & gold (my fav)) and sticking to it. You don’t want to detract from your products with the display pieces. You can easily make your decor in these colors with Valspar plastic spray paint. I used gold spray paint on all baskets and buckets on my table so they did not detract and distract from the products. Make sure the products stand out and are the main focus of your booth. If you have a rainbow of products, stick to a solid white or all black color scheme for table cloths, baskets, bins, signs, ect. TIP 2. CLUTTER – Avoid clutter like the plague. No seriously, if you have too much inventory for your table space, leave multiples below the table and put them out as needed. The last thing you want is to have your items piled so high that a customer has to dig, or knock over, or move other products to look at the one that interests them. Don’t clutter, don’t be bare- have a good assortment and store the rest until space frees up, wherein you can replenish what has sold! TIP 3. GROUPING – I cannot stress enough how essential it is to group like items. Think about it- when you go to the grocery store are the eggs next to the canned green beans? NOPE. Keep the eggs with the eggs, or in your case, the purses with fabric items, cards with other cards, jewelry all together. Don’t put one of each thing all over the place, group the similar items and multiples of the same item together. You can extend this to color grouping of your products for a real eye catcher. TIP 4 . HOLIDAYS – Use upcoming holidays to your advantage. Customers are driven by holidays. Think to fill specific needs for the upcoming holiday, example: cute little gifts of hot cocoa mixes, autumn hot tea pods; spring bunny candy or flower themed wreaths; or back to school teacher gifts. Your shoppers will be oohing and ahhhing over everything and it will ignite a reason or person to buy that cute holiday craft for! TIP 5. BE CHEAP – With the setup, that is. You don’t have to buy things for your set up. Look around your house: that empty amazon box (oh I know you have some laying around! ), use it underneath the table cloth for height; your magazine basket- use it to hold soft blankets or quilts that contrast with the hard basket weave; the storage ottoman in your living room makes an adorable way to display quilts, blankets, or to raise bins of assorted crafts in to add surface space to your display. Ladders can be excellent display pieces- they attract customers because it’s unique and you can add planks to each stair for added space for small items or bars for hanging clothes/knits, or throw handmade quilts over the rungs. Think about pieces of furniture or accents in your home and how you can borrow them for your craft fair booth. If you are going to buy, shop around for the best price. Did you know it is cheaper to buy a twin sheet (Amazon) for a table cloth than a craft fair designated table covering. TIP 6. DEMONSTRATE – Nothing gets the attention of shoppers like you making your crafts in front of them or letting them try it out. I’m not telling you to make items and ignore the customer, but it is interesting to shoppers to see you in action. Bonus points if you have a little station set up to make a card, stitch a felt flower together, or make a mini ornament. It likely won’t make them go out and start a competing business, but it will help them remember the cool thing they helped make, or saw you making first hand, or took home as a memento. It will make them feel special (they are! they keep your love of crafting alive) and it will help you stand out in their memory. TIP 7. VIGNETTES – (vin’yet) n. a small grouping of objects that create a pleasing focal point and tell a story. 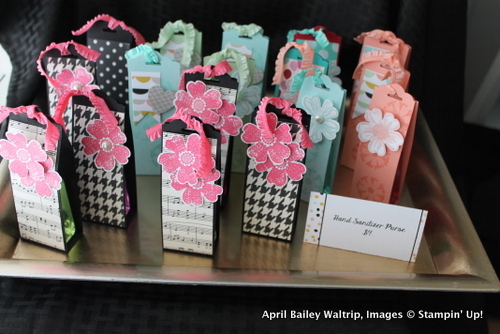 Here is an example of a grouping of hand sanitizer packets (See my Tutorial here) on a gold tray with a little tent sign. It looks like a bathroom counter display (mimicking the soap theme). TIP 8. BUSINESS BASICS – Don’t forget to place your business cards out on display, which should be equally as cute and crafty as the items you are selling. You want people to contact you in the future, so make sure they are visible. You also want be able to follow up with buyers to let them know about sales, other events they will find you at and any customer or referral special you may have, so GET THEIR CONTACT INFO. A great way to do this is a door prize form- name, email, phone number! It is a must- how can you follow up with them if you don’t have their info. *Vendor tip*- Of someone seemed particularly interested, I pull their entry form back out and jot down a note on the back or jot down their name in my planner so that I remember who to follow up with and for what items interested them most. Lastly, it’s always good to lure them in with chocolate. Set out some chocolates or hard candy next to your business cards and door prize so they are sure not to miss it! TIP 9. HEIGHT – Height is your BIGGEST advantage in a limited space (get it? haha). A lot of small events provide only 8×8 or 10×10 spaces. That’s enough space for three strategically placed tables or less. You need to make using height a priority in your set up. That means hanging things from your tent, peg boards or racks that allow for items to be placed in your vertical space, baskets on the ground, items on the tables and boxes under the table cloth to give areas height. Not only does using height give you more square footage, but it looks aesthetically pleasing as opposed to everything being on all one level. TIP 10. SIGNAGE – Signage is HUGE. How will customers know who you are or what you are selling if you don’t have a sign? It speaks volumes about your business, the product and the brand. From your sign, they will instantly know what type of items you sell, what your business name is and your affiliation, if any. For me, that means displaying my Stampin’ Up! logo sign on my front most table cloth, as well as handmade banners with the same adorning the tent or other sides of the table so that it is visible from almost anywhere in the venue. From the handmade banner, they will know I make papercrafts, that my brand color is an pink, black and gold, and my font is fun and scripty. I have branded my business to suit me and it visually tells them about it. Make a sign, buy a sign, definitely have more than one sign and make it personal and equivocal to your business. **BONUS** MARKDOWNS – We all love a SALE, right?! People innately LOVE getting a good deal. Want to seal the sale? Add a markdown sign with items listed and the prices slashed with a new, lower price highlighted. Your patrons won’t be able to pass up a good deal and that will ensure that you make the sale. Slashing the priced in the afternoon is a good way to get rid of inventory that isn’t moving. I want to hear all about your recent craft fair experience. Do you already use these tricks? Are you going to pick a few and try them out at your next show? Have they helped your sales? Let me know by leaving a comment below! As always, happy crafting! Ifound old hard suitcases . Strip out insides. 1 case stands vertically , cut a piece of wood to fit each side covered in white textured wallpaper. Glued in wood then put 4 screws from back ( outside of case) hang jewelry from push pins . Leave jewelry in standing open case.for display . when done close . I put extra jewelry in case for other displays place over another piece of jewelry. 2nd case .keep FLAT . .fill with jewelry displays in jewelry trays use push pins to hold in place , use paint rollers under top of trays to slant. close case leave on table for other displays When done repack trays Important when packing keep flat case flat other case vertical . I bought real jewelry trays with velvet insides each tray fits into each other , or use painted boards (put bubble wrap in between boards when packing to keep jewelry in place & not to ruin jewelry) leave case flat and vertical when traveling to & from show so displays don’t fall . You offer great tips. Some I have been using. In a 3 day show I might have 10 thousand people there and only have 2-3 hundred people come into my booth. What am I doing wrong? Can I send you a viedo of my booth? I would like to improve. I’d love to see it. Email me photos and I’ll send some tips. I like what you have said and I am doing some of these things. I would still like to improve . Can I send a viedo of my display to you to get a critique ? Where do I send it? I have been in street shows or festivals and people just don’t come in. There can be ten thousand people on a three day event and I will get about 2-3hundred that come in to see my paintings. Help! Thanks Kathryn! I’m glad you enjoyed the tips and tricks.